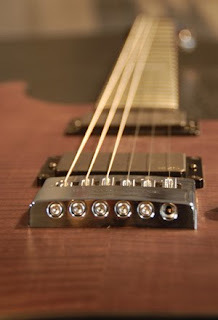 Also exhibiting at CES 2010 was EverTune with the latest in self-tuning bridge technology. Four years in development, the EverTune bridge is a purely mechanical device. The strings are loaded in to the 'adaptive spring tensioner' and the tension on each string is set by the user. During play, as the strings gradually loosen and lose their pitch, the spring tensioner compensates by adjusting the string back to the tension levels that were previously set. Interesting. The notion of a guitar that doesn't go out of tune I'm sure, will appeal to all players, beginner and pro alike. Depending on price and sheer invasiveness (or lack thereof) of installation, this thing could turn out to be the Floyd Rose of its generation. Tremelo, B-bender and bass versions of the EverTune are in development. Reminded me of one of those Eric Johnson set-up posts, where they talk about keeping the intonation in better by changing the strings more often.